Download DirectX 12 for Windows 10 64 bit 32 bit offline installer. Tips on how to utilize your graphic hardware with DirectX 12 for gaming. 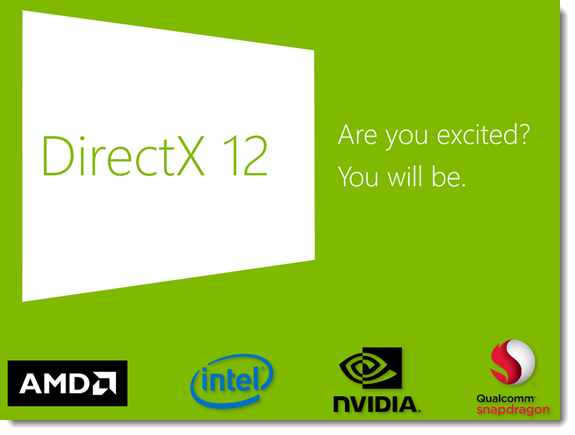 A great news for all PC gamers in the world, the very much awaited DirectX 12 has finally been released. So, what makes DX 12 so much better than its predecessors, and how do you download DirectX 12 for Windows 10? Well, DirectX 12 was announced early 2014 with all the unbelievable improvements that was yet to even believe exist. Now that we can finally get our hands on it, it’s true that the performance and quality are drastically improved in games and programs that support DX 12. You have probably seen DirectX 12 news everywhere on the internet, the Youtube, blogs, twitters, because it does mean a lot to the gamers. Listed below are a few improvements you can expect when using DirectX 12. And many more features that we didn’t put in the list. It is simply a must to upgrade to DirectX 12 as soon as possible to utilize what you have and dig up much more performance from your existing CPU and graphic card. The bad news is that DirectX 12 is only available for Windows 10 and will be supporting only Windows 10 in the future. There isn’t any news about it being planned to support for any of the older Windows OS, Windows 8, Windows 8.1 or Windows 7. If you want to get your hands on DX 12, you simply have to upgrade to Windows 10. Now that Microsoft offers free upgrade from Windows 8.1 and Windows 8, you should do it already as soon as possible before the deal ends. The best, quickest and the only way to download DirectX12 for Windows 10 is via Windows Update. By default, as soon as you install Windows 10 on your PC, DirectX 12 should have already installed along with it. If it hasn’t already installed, launch Windows Update by going to start, type Windows Update and hit enter to start the update automatically. It may take a while for Windows Update to search for and locate updates that your Windows 10 needs. Give it some time, it can take up to hours if you have a slow internet connection like us. There is currently no standalone Offline Installation yet being released on Microsoft’s site (sorry for the title). We will let you know as soon as it’s released. Unfortunately, as mentioned before, downloading and installing DirectX 12 isn’t possible for Windows 8, Windows 8.1, Windows 7 or any other Windows older than the latest Windows 10. DX 12 supports only Windows 10 and will continue to support only Windows 10 and its successor (perhaps DirectX 13 for the next Windows). The question itself makes no sense actually. One cannot downgrade their DirectX as the newer version will backward compatible with the older version of DirectX. It means that, for example, if a game requires DirectX 11 to run and you have DirectX 12, it should run just fine, otherwise it would have been other reasons that cause your problem. If you receive errors specifically mentioning files from DirectX such as the d3dx9_35.dll missing error, you may want to read on how to download DirectX 11 for Windows 7/8 and how to use End-User Runtime to download DirectX 10, 9.0c or older for Windows 10. The good news is DirectX 12 is made compatible with wide range of hardware including some of the old ones. Well, most graphic card you can find in the current market are compatible with it. If you want to be sure, check online for DX 12 graphic card compatibility for the graphic hardware model that you are planning to purchase before you go to the store. The newly released graphic hardware should already have a DX 12 compatible label on them. Update: Beside the recent rumors regarding there won’t be Windows 11 and Windows 10 being the last ever and final version of Windows franchise, there are also rumors about DirectX 12 being the final version. There seems to be no DirectX 13 in the future.